Flower Girls Wedding bouquets and Wands. When planning a wedding on the Gold Coast or Brisbane you will find beautiful wedding flowers and bouquets and other wedding flowers. Botanique can help you design perfect flowers for your style of wedding. We can help you choose the best flower girl wedding bouquet designs for your height and shape as well as the theme of your wedding. Botanique, located on the Gold Coast and delivering to Brisbane can order your specific colours to suit your wedding colour scheme. See below some of the wedding flower designs available. 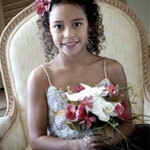 Tina designs beautiful fresh flower bridal bouquets with over 30 years experience as a florist in weddings. Tina can help you choose complimentary colours and keep you informed as to the very latest designs, techniques and colour combinations. Your wedding is important to us, to exclusively book the date there is a $200 booking fee. Once you have decided to book our services please call for a consultation and we can specifically coordinate your colour choices, bouquets sizes and varieties. This fee is then redeemable off the price of your wedding package but not transferable.